TOKYO — At least nine elderly people were killed when their nursing home was flooded in northern Japan after Typhoon Lionrock dumped heavy rains on the area. The bodies of all nine residents were found at a nursing home in the town of Iwaizumi in Iwate prefecture, when police were checking another facility in the flooded neighborhood, said Takehiro Hayashijiri, an official at a prefectural disaster management division. Hayashijiri said identity of the bodies or other details, including whereabouts of their caretakers, were not known. NHK said the nursing home was for the residents with dementia. Japan's NHK national broadcaster said authorities have found two more bodies in another town in Iwate. Its footage showed the nursing home partially buried in mud, surrounded by debris apparently washed down from the mountains. A car by the home was turned upside down. "We're making a government-wide effort to assess the extent of damage," Chief Cabinet Secretary Yoshihide Suga told reporters. The government sent Self-Defense Forces to help in the rescue and cleanup of the damage caused by the typhoon. At least two rivers swollen by the typhoon broke through their banks, flooding areas in northern Japan. The embankments gave way before dawn on Wednesday on the northern island of Hokkaid, said NHK, quoting Japan's Ministry of Land, Infrastructure and Tourism. Authorities in the town of Minami-furano are reporting many people trapped in houses and shelters by flooding from the Sorachi river, NHK said. Aerial photos from Kyodo News service also showed serious flooding south of Hokkaido in Iwate prefecture on Honshu, Japan's main island. Typhoon Lionrock slammed into northern Japan on Tuesday evening, hitting an area still recovering from the 2011 tsunami. The Fire and Disaster Management Agency said at least three people were injured in three northern prefectures — Aomori, Akita and Miyagi since Tuesday. 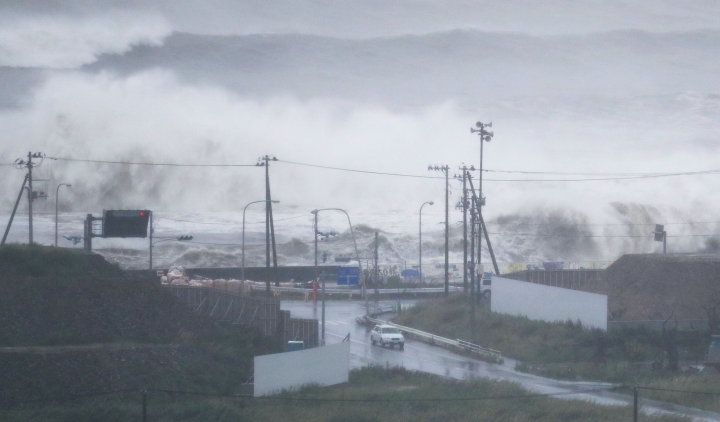 It made landfall near the city of Ofunato, 500 kilometers (310 miles) northeast of Tokyo late Tuesday before moving away from Japan. It's the first time a typhoon has made landfall in the northern region since 1951, when the Japan Meteorological Agency started keeping records. More than 170,000 people were subject to evacuation, including 38,000 in Ofunato, according to the Fire and Disaster Management Agency. More than 10,000 homes in the northern region were without electricity, with power lines damaged from the winds. The scene of large parts of northern Japan covered with muddy water was a shocking reminder of the tsunami disaster that struck the region five years ago. Iwate, hardest-hit by the typhoon, is one of the areas still recovering from the tsunami damage. The March 2011 earthquake and tsunami left more than 18,000 people dead in the wide swaths of Japan's northern coast, including 340 in Ofunato. At the Fukushima nuclear power plant, decimated by the 2011 disaster, some outdoor decommissioning work was suspended as a precaution.